The best option is a raw food diet, but this is not managable for some owners. The next best option is a grain-free diet. I recommend Evo, a grain free dry dog food. Vitamin E excellent for skin and heart, 200-400 units per day. Also, as far as hot spots, adding some vitamin E and fish oil supplements daily really does wonders for skin on dogs just as it does on people. Recommend fish oil capsules to help skin and immune system: one capsule per ten pounds of bodyweight per day. I mix the wheat germ oil into the food. She has been eating her food dry. Vitamin C: Start with low dose of 50 mg per day for young puppies and gradually increase as the dog grows to 1500 mg/day. A rapid increase can cause digestive discomfort for the dog. We recommend yogurt, cottage cheese, string cheese. Avoid chocolate and raisins, which are toxic to dogs. Dogs should not be fed food with grain. Canines are descended from wolves. They are not designed to graze in wheat fields. You could try using some pedigree canned puppy food mixed with the dry. It is not unusual for a dog to be off of their food when changing homes. I would not worry about spoiling her and just feed her chicken or chicken and rice. I will give you a call. The food I feed is called Enhance. You should be able to find it at a feed store. If you cannot get it near you then I suggest Nutro Max or Nature's Recipe and either of these can be found at Petsmart or Petco. vitamins E(about 400 units daily) and fish oil ( 1 soft gel capsule for each 10 pounds of body wieght daily). this will keep his coat looking like a mink coat. 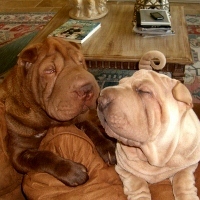 "Please meet Luci Lu and Charlie Chen... they have healed our hearts..."